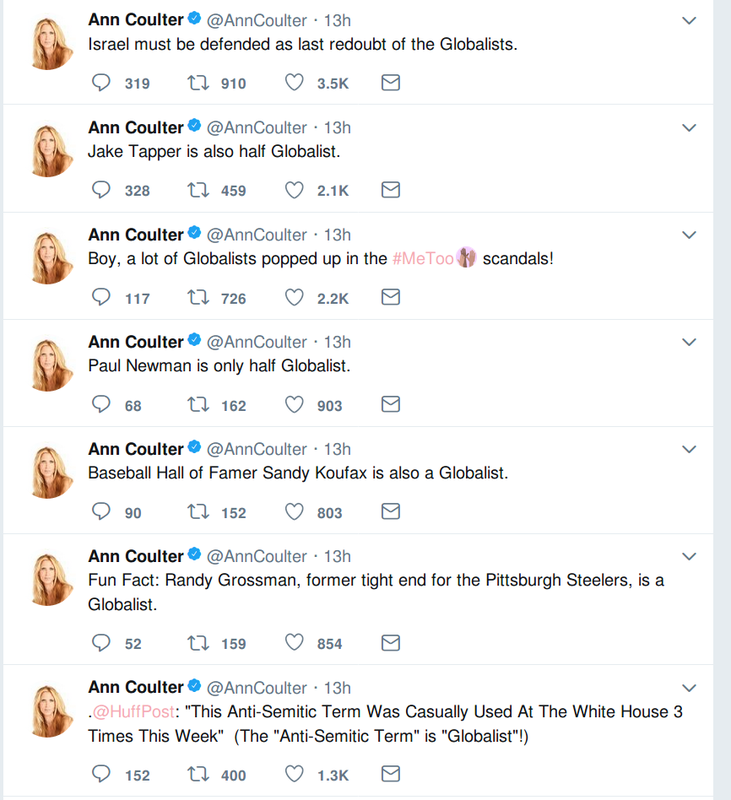 Far-right political commentator Ann Coulter excited her many racist fans Friday morning, repeatedly using the word "globalist" as a term to describe Jewish people. Coulter, who has previously attended events organized by racist groups, took to Twitter to mock a story from HuffPost which criticized some Trump administration officials and a Fox News reporter referring to outgoing White House economic adviser Gary Cohn, an Ohio native who is of Jewish descent, as a "globalist." Instead of stating her opinion that "globalist" isn't synonymous with "Jew," Coulter repeatedly used the former word as a stand-in for the latter one. Coulter's tweets inspired much praise from her legions of white nationalist fans on the internet. Finally, several argued, the conservative author had embraced her inner racist. "I've been waiting for this moment for so long," one member of 4chan's /pol/ forum wrote. "Pray for Anne. She's a huge public figure and is going to get attacked for this. I can already see it. I'd be surprised if they don't delete her Twitter after today." Others on the fringe argued that Coulter has agreed with their viewpoints for some time but has merely kept her views hidden for fear of not getting booked on cable news shows. "Have you read her books? Have you read between the lines, in her books? Ann Coulter's been full 1488 before most of here knew 1488 was a thing," another /pol/ poster wrote, using a slang term that has been popular among neo-Nazis. "She's just revealing a bit more of her power level now in a way that gives her plausible deniability." This is not the first time that Coulter has made remarks about Jewish people that have delighted neo-Nazis. In 2015, she blasted Republicans who were competing for their party's nomination for allegedly pandering too much to Jews during a presidential debate. "How many f**king Jews do these people think there are in the United States?" Coulter wrote on Twitter. "I like the Jews, I like fetuses, I like Reagan. Didn't need to hear applause lines about them all night," she tweeted after being criticized. Also in 2015, Coulter defended the idea of flying the Confederate battle flag and criticized the position of then-South Carolina governor Nikki Haley for wanting to take it down. "I'm a student of American history," said Coulter. "I would really like to like Nikki Haley since she is a Republican. On the other hand, she is an immigrant and does not understand America's history." Haley is actually a native-born American of Indian ancestry. Last year, many praised her for claiming that there were a "disproportionate number of Jews" working at CNN. Coulter's views about Judaism and people of Jewish ancestry appear to be very complicated and contradictory. In 2007, Coulter called for people who believe in Judaism as a religion to abandon it in favor of Christianity. "I don't think you should take it that way, but that is what Christians consider themselves: perfected Jews." In 2014, the controversial commentator said that she wished Israeli prime minister Benjamin Netanyahu was America's president. "We are a country. We have borders. And Netanyahu enforces them. Why can't we do that in America?" she said during a Fox News interview. Coulter repeated the sentiment in a 2017 tweet. "Netanyahu for President!" she wrote in a post praising the Israeli politician for implementing large-scale deportations of African undocumented immigrants.